If you were a thief, would you rather see a door guarded by our Medeco brand lock or a hardware store lock? Since locks are your first line of defense, it pays for you to know as much as the burglars. Here are the targeted weak points, and what Medeco has done to guard them. 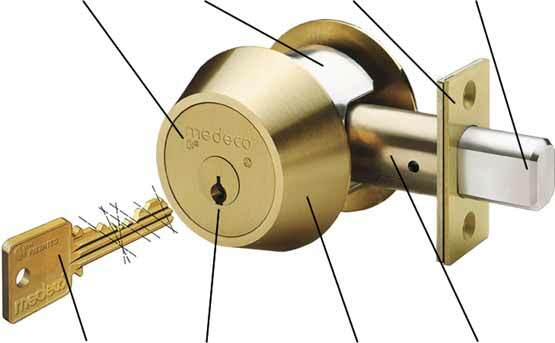 Medeco is built with strategically placed, hardened steel inserts to provide the utmost resistance to drilling. They Hammer The Lock Housing. We use solid brass and secure it with high-tensile steel bolts for maximum resistance. They Kick In The Door. The strike plate has a special design with 2” screws to anchor the strike directly to the building frame. They Saw Through The Bolt. The bolt is made of hardened steel, and is virtually impossible to saw through with a common hacksaw. Patented Biaxial system makes it virtually impossible for someone to copy your key without your permission. They Pick The Lock. Double-locking action makes Medeco locks virtually pickproof. They Wrench Off The Lock. Our solid brass collar spins under pressure so a wrench is ineffective. They Pry With A Crowbar. Our hardened steel bolt is surrounded by heavy-gauge tubular steel to resist crowbar attack.